The story broke on February 18, 2011 announcing that Maine Fishermen caught a record 93 million pounds of lobster in 2010. Now that’s quite a haul! According to a report from the Maine Department of Marine Resources (DMR), more than 93 million pounds of lobster were caught in Maine’s waters during 2010. This giant lobster catch represents an estimated increase of 12 million pounds of lobster from the previous 2009 record of 81 million pounds. What that meant for lobster gourmets across the country was an abundant supply of fresh, first quality lobster. From coast to coast, the American seafood eating public enjoyed America’s favorite comfort food. As for bragging rights, ask anyone from Maine, and they will quickly tell you the best lobster in the world come from their rocky seashores. Who is actually out there making the catch? All last season more than 4,260 licensed commercial lobster fishermen went to sea each day filling their boats with lobster. The value of the boat catch for the year was up to nearly $310 million, much better than in 2009. According to DMR officials, the large catch was a definite spur to the local fishing village economies, especially with the price of fuel and bait being higher than average. Local officials said the last three years have been slow so a good lobster catch spurs all the related businesses, including trap builders, truck dealers, bait dealers, boat yards and others. The lobster season is year round, but during the winter only a few hundred boats go out on a regular basis, according to lobster wholesalers that buy from the fishermen. This means much of catch is stockpiled in large, natural salt water lobster pounds. Which is why lobster lovers can enjoy baking and steaming lobster year round. Fresh Maine lobster can be ordered online in the winter, spring, summer and fall and shipped overnight anywhere in the country. Lobster accounts for more than 70 percent of the value of all marine species harvested in Maine. More than 90 percent of U.S. lobster landings come from Maine, Massachusetts and Rhode Island. Kindly notify me of special priced offerings on Maine Lobster and large Sea Scallops, expecially Digby Scallops. Thank you! 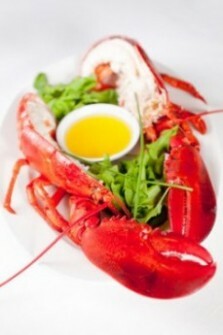 Previous Previous post: Is Lobster the food of Romantics on Valentine’s Day?